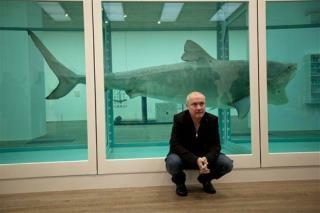 (Newser) – It turns out artist Damien Hirst's famous displays of dead animals preserved in formaldehyde may have been dangerous to more than just artistic sensibilities. A study published this month in Analytical Methods found Hirst's pieces were leaking formaldehyde gas at levels 10 times higher than the legal limit during a show at London's Tate Modern in 2012. They were also found to be releasing gas at a more recent show in Beijing. Both the US and EU classify formaldehyde as a carcinogen, the New York Times reports. The short-term effects of exposure include nosebleeds and coughing. The study's author, Pier Giorgio Righetti, says visitors were unlikely to have been affected by the gas, but gallery staff who spent more time around the tanks may have been. So the audience got the opportunity to be part of the work. But the show was a gas.